Light Grey Art Lab’s newest exhibition, Blowout, features the personal work of 40 international tattoo artists who have come together to express the high energy, powerful linework, and provocative nature inherent in tattoo art. 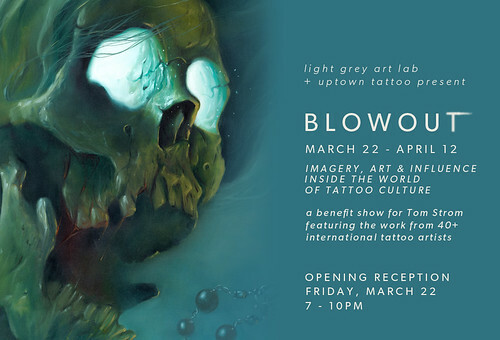 Curated by Uptown Tattoo, one of the Twin Cities most beloved tattoo shops, Blowout features work from some of the best tattoo artists from around the world, and gives you an interesting look at the work these artists create outside of their day jobs! And it's for a good cause! Not only does Blowout showcase the incredible talent and artistry of tattoo artists, it also exemplifies the sense of family found within the tattoo community. When local tattoo artist Tom Strom was involved in a biking accident, blowing out two disks in his back and requiring extensive surgery, local artist Nic Skrade the others at Uptown Tattoo began organizing a benefit show to help Tom pay for the overwhelming expenses of surgery and recovery! Our hearts go out to Tom and we wish him the best of luck! 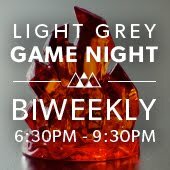 Come down and show your support, as well! And that's not all! Inspired by the spirit of Blowout, Light Grey Art Lab curated secondary exhibition, Beautiful Forever, which bring illustrators, designers and artists together to create a series of flash-art inspired temporary tattoos. Mixing the severity of tattoo art with the ephemeral nature of temporary tattoo stickers, Beautiful Forever is a fun and non-committal way to bare your style on your skin! 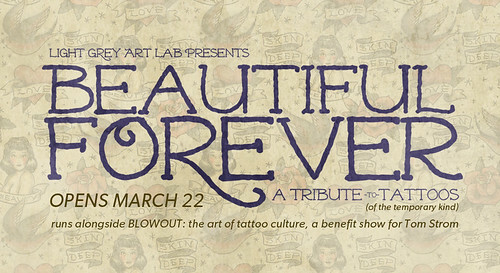 The opening reception for Blowout and Beautiful Forever is Friday, March 22nd from 7-10 PM. 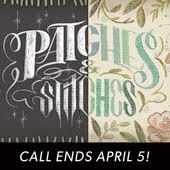 Remember, the Opening Reception is Friday, March 22nd from 7- 10 PM! We're located on the corner of Stevens Ave and 26th Street - right across from the Minneapolis College of Art & Design. Street parking is available on Stevens, 26th and 1st Ave.